Chris Townsend Outdoors: Meall a' Bhuachaille - the begining and end of my hillwalking year. 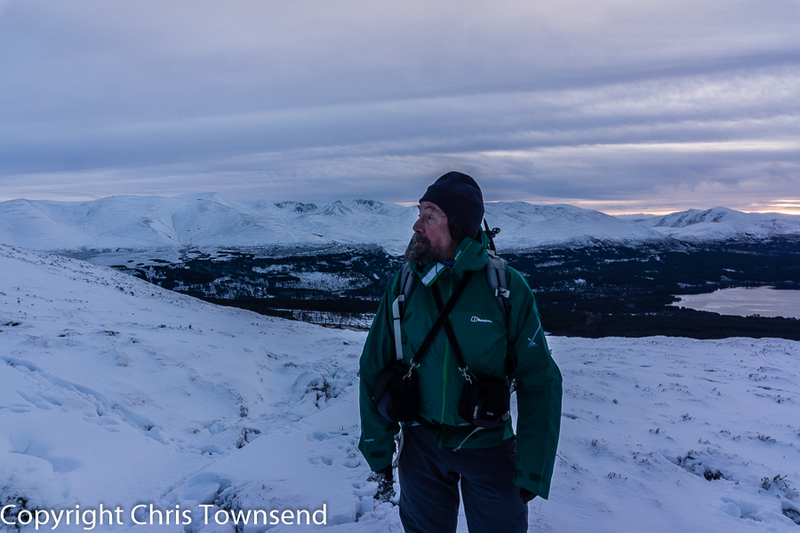 Meall a' Bhuachaille - the begining and end of my hillwalking year. This year my first hill walk, back in early January, was up Meall a' Bhuachaille above Glenmore in the Cairngorms (see this post ). 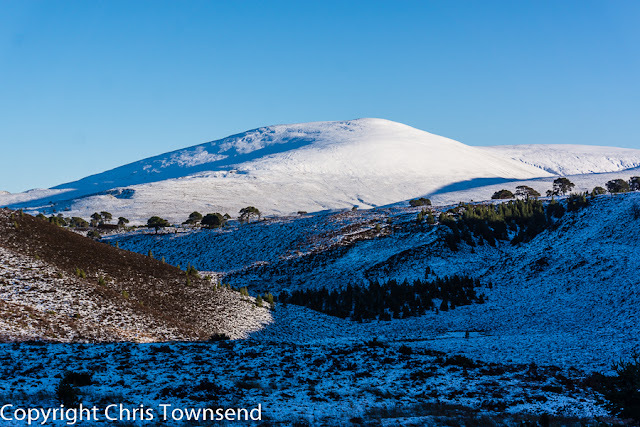 Now it looks like the last hill walk of the year will also be Meall a' Bhuachaille, an ascent seized on a day of fine weather in a run of storms. After two days of Xmas cheer on December 27th three of us set off on a cold crisp sunny day, crunching through the thin snow on the track through Ryvoan Pass, pausing to look down on Lochan Uaine, the water green and calm, the temperatures not low enough for any touch of ice. 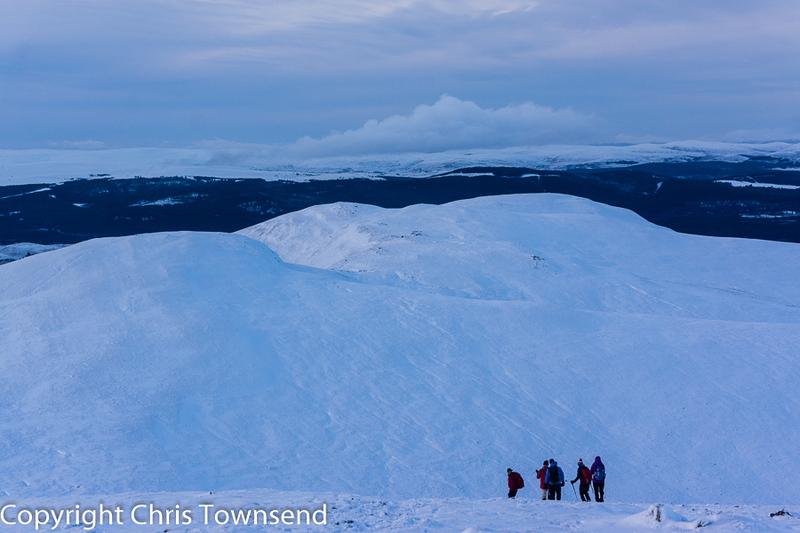 Once we left Ryvoan Bothy and began the real climbing the snow deepened and the wind picked up. In the low sun the Cairngorms were shining. The sky was a deep alpine blue. As we climbed the strenthening wind became bitterly cold. This was a real winter's day. Harsh cries signalled two ravens crossing the hills high above. The snow was criss-crossed with hare tracks along with a few made by ptarmigan or grouse. From the summit a white world spread all around. To the south and the west clouds were building and there were hints of colour from the soon to set sun. Loch Morlich was a shining diamond in the dark of the forest. A peregrine falcon crossed above us, beating its wings as it fought the summit winds then disappearing in a long sickle-shaped glide. A magnificent sight and one I've never seen on this hill before. Others were about, unsusprising on a fine Sunday after Xmas, and parties went past in both directions. Those coming from the west, our initial descent route, had snow-covered boots and gaiters, suggesting deeper snow that side of the hill. And so it was, with many deep drifts, some reaching to the thighs. The snow was cold and dry, soon brushed off, but unable to bear any weight. All too soon we were passing the first trees and then walking through the confines of the forest. A fine hill day to end the year was over. Lovely hill - too often passed by on the way to or from somewhere else! We've been guilty of that ourselves, a good few times, so we put right the omission earlier in the year. 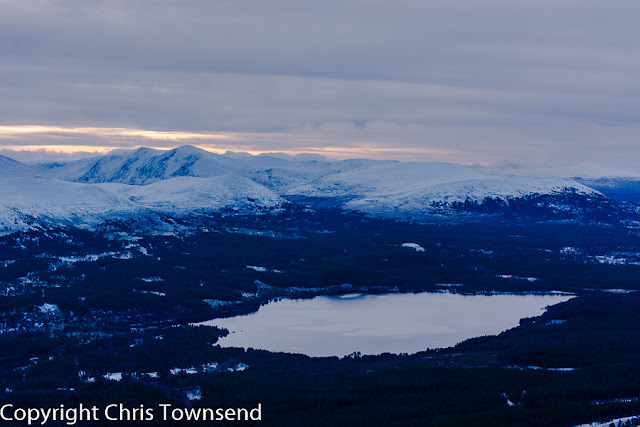 Lovely views too: from up there you can get a feel for what the forests of Rothiemurchus and Abernethy might have been like in their heyday.